The Propaganda Machine (Left To Right): Michael Hollywood- Harmonica, Vocals. Stann Champion- Guitar, Vocals. David Bernstein- Bass. Dave Smith- Drums. 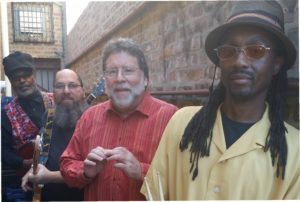 Chicago Music Award Lifetime Achievement Honoree Stann Champion has a new band, and they are ready to take the Windy City by storm! Having been a major pioneer in the creation of Chicago’s Reggae scene in the 1970’s and establishing the unique “Tropical Roots” sound in the 1980’s with his band Roots Rock Society (still going strong after thirty years); Champion decided to create another band that would play the music that first captivated him as a young boy and compelled him to become a musician. 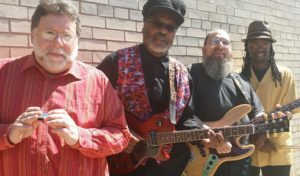 As to be expected, Stann Champion’s Propaganda Machine explores the Roots of Contemporary Music; playing Classic Chicago Blues, early 60’s Garage Rock, and even all the way to late 1940’s Jump Music (when “The Blues Had A Baby” called Rock & Roll). These torrid tunes are interspersed with originals from Champion and Harmonica Player/Vocalist Michael Hollywood, and a couple Ska/Reggae & Soul songs for good measure. Regardless of what era or genre the song is from, the band tears it up with their own signature style. The Propaganda Machine hits hard and doesn’t let up. Champion’s driving guitar and Hollywood’s howling harmonica ride atop David Bernstein’s rock solid bass riffs and a steady flurry of deft drum fills courtesy of Dave Smith; creating a tsunami of sound that gets the room rocking all night long! Stann Champion’s Propaganda Machine is ready to Rock Your World!!! 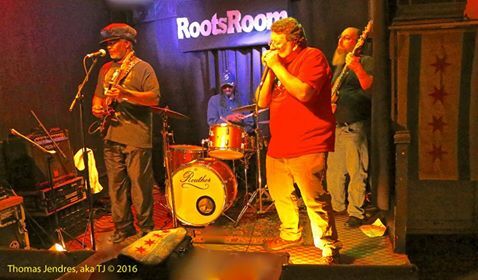 The Propaganda Machine at their first official gig at The Roots Room on 5/20/2016. After several years with his Chicago Music Award winning band, Safari; Champion formed Roots Rock Society in 1986. Roots Rock Society just celebrated their third decade. A recent Lifetime Achievement Award from the Chicago Music Awards has sparked Stann to create this new project, Stann Champion’s Propaganda Machine, and to redouble his efforts to promote American Roots Music and Culture. Champion is also deeply involved in the Community, having been honored numerous times over the decades for his work across the city; and his “Artist Development Center” in Albany Park, The Roots Room, helped numerous musicians/performers find their voice (Michael Hollywood being one of the most notable). 35 years of playing Harmonica and a lifetime of performing experience in various genres inform Michael Hollywood’s work. An Actor/Singer in his teens, Professional Standup Comic in his 20’s, Storyteller/Performance Poet, Tour Guide, Lecturer, Published Author, and now Professional Musician. Michael relishes working with such an airtight ensemble as his trio of band mates. David Bernstein has been a professional musician for his entire adult life and has played in numerous critically acclaimed and award-winning bands. He’s been the bassist in the Roots Rock Society for the last 10 years, so he and Stann have a unique musical connection that makes the change of style with The Propaganda Machine feel as natural as putting on an old pair of boots. Dave Smith has been drumming for a half-century and has literally drummed all over the earth, having done a decade-long stint as the drummer for a globe-trotting Swing Big Band. During this time he visited Europe, Asia, Australia, and all points in between. Dave won a Grammy for songwriting & arranging in 1993 for his work on the debut album of the Reggae Artist Patra and has done writing & arranging for countless other Artists through the years. He’s also held down the drummer’s chair in the Roots Rock Society since 2015. Bringing Chicago To The World is powered by	WordPress 5.1.1 and delivered to you in 0.356 seconds using 30 queries.